Rhubarb Custard Crumb Pie, Oh My! Rhubarb is starting to get plentiful so it was a good choice for my first adapted gluten free pie recipe years ago. This is my favorite rhubarb pie and my go to recipe for a great spring dessert. This is an easy pie even though it has several steps. 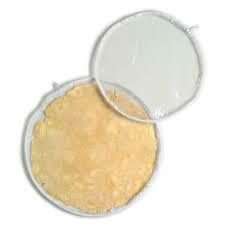 I store any leftover crumb mixture in a sealed container in the fridge; keeps a few weeks. 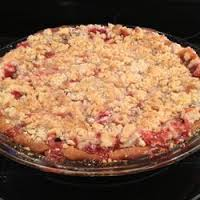 It is different from the usual rhubarb pie because the texture is a bit closer to a crumb cake, no wet, slimy texture and no ultra sour flavor. I think this new version tastes as good as it did when I made it with wheat flour. This GF crust will work for any pie you wish and the GF crumb topping is great for any crumb pie topper. What I am giving you is my mixture of three recipes with some small modifications over time to create my first GF pie recipe. I know it has several steps but each one is easy and you can use these crust and crumb recipes for other pies. I like it because it has a great texture and the flavor is complex but subtly rhubarby. It isn’t really soft or all that custardy but more cake-like in texture. It is a game changer of a rhubarb pie. I promise you that! Mix dry ingredients in bowl of stand electric mixer. Add butter and mix until crumbly and resembling coarse meal. Add egg and juice. Do not leave out the juice; it is critical to the crust texture and structure! Mix until it comes together into big chunks. Shape the sticky mess into a ball with your hands. Put it on a crust sized piece of wax paper (14 x 14 inches more or less), flatten the crust ball some; put on top of it another piece of wax paper and chill it all in your fridge 15-20 minutes while you chop the rhubarb into ½ inch chunks. My sister Karen bought me one of those pie crust plastic bag thingies; has a zipper around the edge. I love it; it works better than wax paper which can get soft and torn as you roll out the crust. King Arthur Flour sells them on line. I highly recommend you get one for making pie crusts from scratch especially gluten free crust. Or just use a sheet of heavy duty plastic! Strong enough to work with the rolling pin better than wax paper. Wet mix: 3 eggs beaten lightly with 1/3 c milk (not skim), and ¼ tsp almond extract. Sprinkle the top of the pie with the crumb mix; use as much as you like. I like about 2/3 of the mixture. Up to your personal taste… It sinks into the rhubarb and wet mixture to create an almost cake like texture and the crumb crust adds lots of sweetness and eye appeal. Bake in a preheated 375 degree oven for 55-60 minutes until bubbly and the crust is light brown. Cool at least 2 to 4 hours before serving at room temperature. This post was originally published in the late spring of 2013. I revised it somewhat since then. I have made this pie many times in past years to rave reviews. One of my friends had it for dessert at my house and said it was the best pie she had ever eaten, gluten free or not! Spring is rhubarb season. Go forth and make pie!